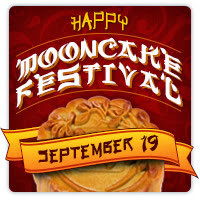 Aside from Chinese New Year, Mid-Autumn Festival or Mooncake Festival is another Chinese tradition that I look forward to every year. If you will search for information regarding this festival online (hello Wikipedia! ), this is a festival where Chinese celebrate union of family or friends, the harvest, and also a time to pray for other concerns like babies, partner and good fortune. I've never attended an actual celebration aside from the events hosted during college, but I like this particular festival because of the main food: mooncake! I'm sooooo happy that when I got back to my area, I found this mooncake on my table! I was even planning on buying one when we were at the mall for lunch earlier. Thank you so much again to my friend, Vicky, for being thoughtful and generous to me today. I can't wait to eat it! By the way, if you are going to Mall of Asia this weekend, the Chinese Deli store Eng Bee Tin is having the Biggest Mooncake in the Philippines on display in the Main Mall (75 inches!) until September 22. Since I'm going there tomorrow, I'll make sure to check their display and I might buy some of their delicacies as well. Hope you didn't have a hard time going home today because of the weather. Have a great evening everyone! yeah! the special mooncakes, though they are a bit pricey (Php150+), masarap talaga sya :) and yes, una kong naenjoy ang tikoy ng eng bee tin haha!